It is easy to see why the Isle of Arran is referred to as ‘Scotland in Miniature‘. The landscape of the north is likened to the rugged Highlands with its mountain-torn skies (after ten minutes we stopped to photograph two deer standing against a backdrop of mountains and purple flowers), whereas the rolling land of the southern part is more like the fields and farmland of the Lowlands. With its mild climate (there are palm trees dotted around the island), stunning coastline, picturesque towns and scenic golf courses, Arran is a truly lovely holiday destination. If you’re staying in self-catering in Arran, here are a few tips on great walks and beaches. Arran is a walker’s paradise, with a number of breathtaking mountain walks (as described by Mountain Leader Lucy Wallace) and a beautiful Coastal Path. The 3 mile walk from Glen Rosa to Brodick is one of the best walks on the island, with gorgeous views of the Goatfell mountains. 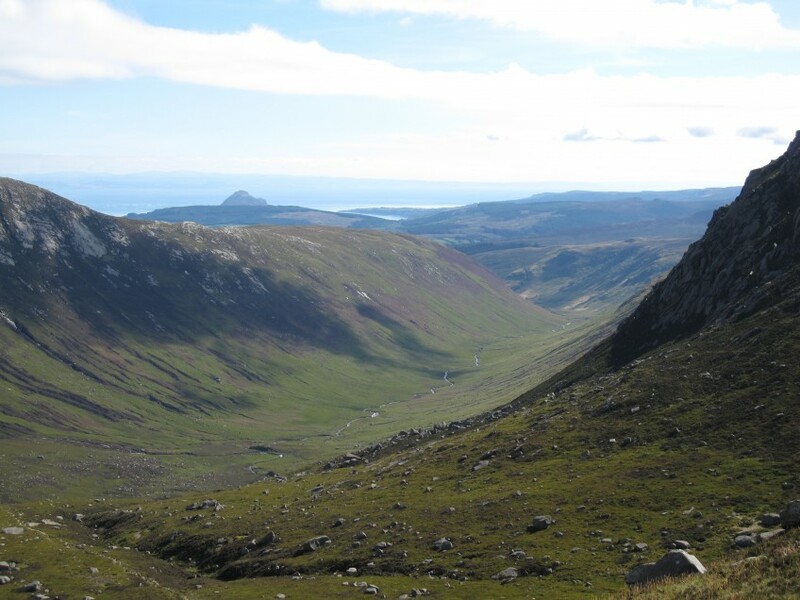 A walk suggested by one of our holiday home owners, with the Year of Natural Scotland in mind, is the stretch of the Arran Coastal Path between Corrie and Sannox. Described as ‘wild and isolated’, they were lucky enough to hear deer rutting on the village green on their arrival into Sannox. The walk follows the Arran Coastal Path on the east of the island, between two pretty-as-a-picture villages and offers fantastic coastal views. A popular walk (especially with families) is the Kings Cave walk, starting in the Torr Righ Forest and leading past a landscape riddled with caves. The views across the Kilbrannan Sound are quite something and you loop back up from the shore through the forest. But, if you’re feeling up to a longer walk, continue along the coast and you will reach the atmospheric Drumadoon Cliff. The shore along from the cliff here has been decorated by towers of stones piled on top of each other, as if the pebble formations are growing like wild flowers. You don’t, however, want to do as I did and end up unintentionally at Shiskine Golf Club when your car is parked at the Kings Cave car park (lovely as the walk was!). So why not download the fantastic Arran Walks on Mobile app to keep you on the right track! The app gives details of ten lovely walks, including Glen Rosa to Brodick and the stretch of Coastal Path between the Kings Cave and Drumadoon. Arran has a number of lovely beaches, all quite different in character. Blackwaterfoot Beach is nestled against Shiskine Golf Course and is a popular long sandy beach, ideal for blowing away a cobweb or two. The secluded beach at Dougarie (one of my favourites on the island) is a quiet place to picnic, with hills hunched behind and a stretch of sand spotted with boulders and stones. But a real hidden gem is Kilmory Beach; tucked out of sight down a farm track at Torrlinn, on the island’s south coast. I wouldn’t have come across this beach at all, if we hadn’t happened to stop for ice cream and ask about beaches nearby. It’s another long sandy beach, torn by jagged cracks of black rock and lapped by a dip-dyed sea. It also offers gorgeous views across to Ailsa Craig. If all the fresh air tires you out, refuel at Coast Cafe in Whiting Bay. It’s a wonderful little cafe, with pretty sea views from its conservatory, delicious food and friendly staff. 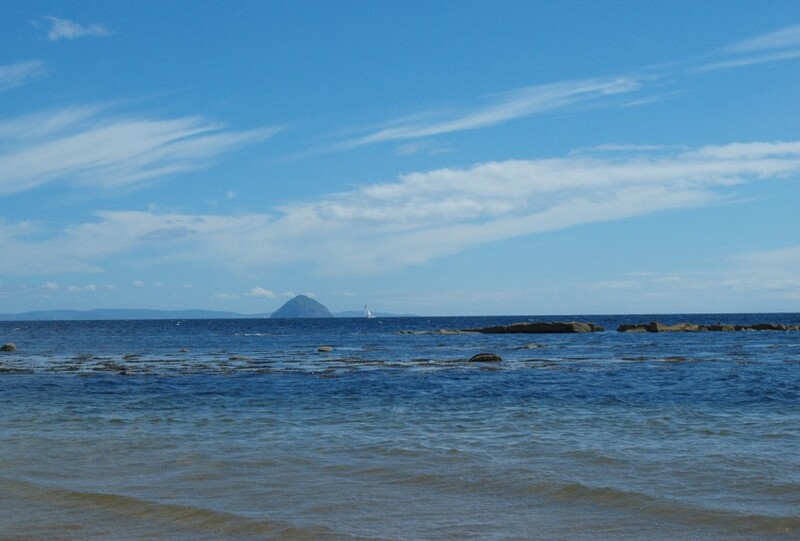 Do you have a favourite beach or walk on Arran? Leave your comments below, we’d love to hear from you!